The connotation with the word dashboard is that of a car (or perhaps other vehicles). Nevertheless, the word comes from a dashboard on horse carriages, which prevented the passengers of getting dirty due to the horses trot on the ground (hence dash): an upturned screen of wood or leather placed on the front of a horse-drawn carriage, sleigh or other vehicle that protected the driver from mud, debris, water and snow thrown up by the horse's hooves (Oxford Dictionary). Nevertheless, it is nowadays closely tied to phenomenon of control panels that allow for information retrieval and action. Examples of these dashboards are a car dashboard which provides information relating the car (speed, amount of fuel), or Google Analytics, which let the admins or moderators of a website see into the statistics of a website. Based on this information, dashboards provide a function (both directly and indirectly) to enhance or tweak performance, constructing a power relation between the ones that have direct access to the dashboard, and those that are subject of it. This research report will approach a "dashboard of dashboards", using methods designed by the Digital Methods Initiative. Approaching dashboard images over a period of time, a lineage is created wherein one can analyze change over time and medium specific changes in Google Images' perception of dashboards. The result will be a cohesive paper contributing in the ongoing debate of dashboard (interfaces); methods and findings relating to the DMI; and a lineage of change over time and power relations between the dashboard user and provided information. Interfaces and dashboards are in constant connection with data. The underlying software structures, algorithms and database governmentalities form the basis on which interfaces and dashboards are created. Both the interface and dashboard provide information to the user, and functions as a mediator between what is on the screen and what the user can collect. The combination of real-time data, the objective of the dashboard and the 'faith' that is put into the use of a dashboards, provokes the question of dashboard objectivity. There are several key elements relating to dashboards: the interface software structure behind it (what is shown, what is not shown) and the algorithms combined with the power that one accessing a dashboard has over those that do not have access to the dashboard (and hence, the data). Firstly, the interface that is shown on a dashboard is subject to the subjectivity of the developers. By providing functions or modules build into the (standardized or custom made) dashboard, certain values are enhanced whilst ignoring different information. Because of this, the user of the dashboard is subject to the subjectivity of those that make the dashboard; the user takes part within a "grammar of action" (Agre 745). The grammars of actions are build in, either on request or within a standardized template, to provide the user the best information reaching its objective. Secondly there is the use of algorithms relating to the aggregated data that is shown on dashboards. As Cheney-Lippold suggests, algorithms base their choices on the dividual of ones subject: We no longer find ourselves dealing with the mass/individual pair. Individuals have become dividuals; masses have become samples, data, markets or banks (5). The dividual itself is part of Deleuzes society of control, which elaborates on Foucaults disciplinary societies of closed spaces. Within the society of control, ones dividual is not within an enclosed space, but is in different places at the same time. Though, this explanation is heavily reduced and minimized, it reflects the theories of Foucault and Deleuze. One must know that dividual data is used within a system of algorithms to either place them in or move them between categories, or define new or differentiate existing categories (Cheney-Lippold). At the same time, dividual information may be manipulated by those that provide them, thus creating false data for algorithmically analysis - and thus categorization. Because of this we enter a governmentality Dodge and Kitchin call automated management. 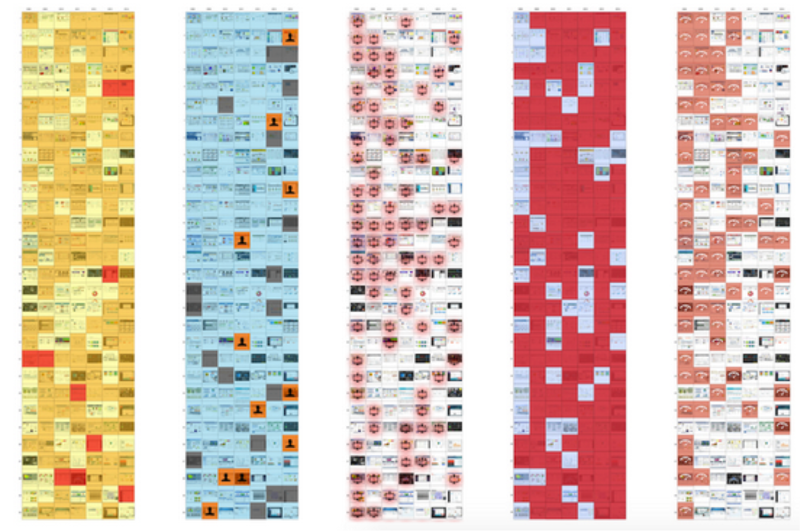 Researching the visual representations of Google Images, one should keep in mind that dashboards themselves are a heavily subjective concept, subject to several discussions related to power, control and software. The approach taken in this study does not reflect any interactive use with the dashboards shown, but keeps the above-mentioned theories in account relating the research question, methodology and results. 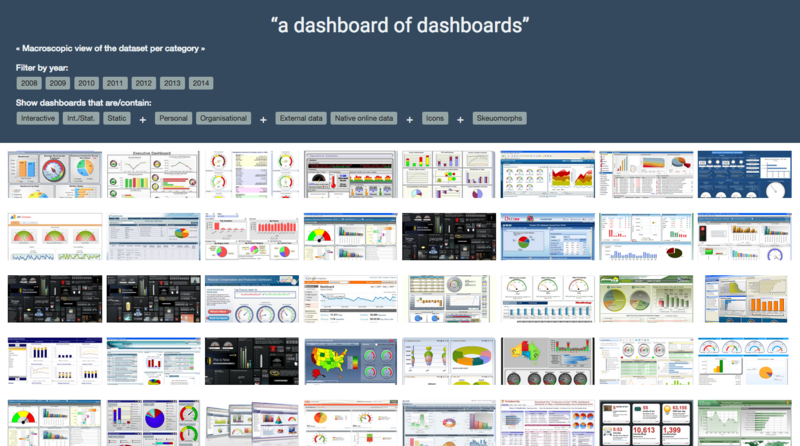 What can a lineage of dashboards, as suggested by Google Images, tell us about the evolution of dashboards? How could a lineage of dashboards be used as a visual provocation to provide a dashboard critique? What do the the visual aspects of dashboards and their specific use indicate about the way they structure and suggest control? The present understanding of the Web opens up the possibility for using online data in order to research society and culture and make online grounded claims (Rogers 4). One could say that we are in an era where the virtual can function as indication of the real. There is no clear boundary between the online and offline anymore; they are intertwined. Therefore, Google is an interesting medium to do research with. An important dualism that should be kept in mind is that of using online media to research the workings of the system and using online media to study societal or cultural developments (Rogers 95-7). The choice was made to use the highly neutral search query, ["dashboard"], as this unstructured and open ended query leaves room for discovering Googles rendition of the term, instead of emanating it from a specific point of view. In order to set up a lineage of dashboards and analyze Google Images approach towards the dashboard, a dataset was created for the years 20082014. In general, the dataset consists of images retrieved over the daterange of a year; the year 2008 is an exception because the first images that were saved for the query dashboard on Google Images only date back to the 16th of April 2008. 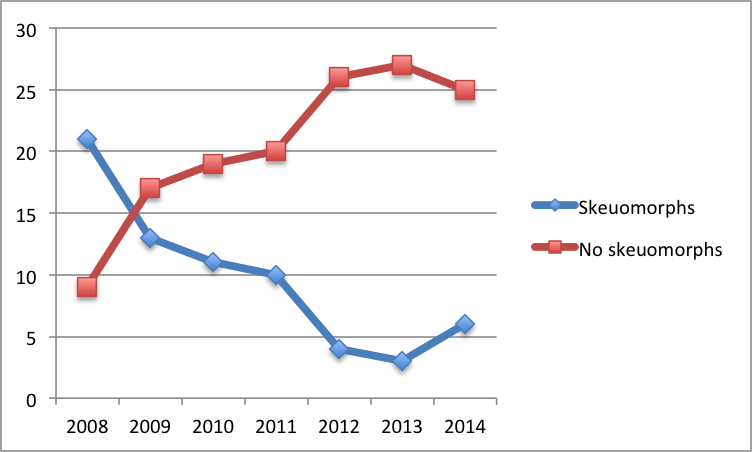 Therefore, the dataset for the year 2008 started from that point on. Therefore, there had to be a slight change in methodology. The top thirty results were harvested using the Google Image Scraper tool, the larger images were downloaded manually. The Google Image Scraper tool was used to fetch the URls to Google Image results with a specified date range. The top 30 images of these result pages were manually downloaded and sorted in order of Google raning. Dashboards were categorised according to the binary division of dashboards being used for either organisational or personal purposes. A dashboard is considered organisational, if the dashboard is being used by a company, health institute or representing sales/profit statistics. In contrast, personal dashboards are being used for managing personal data like body/health measurements or bank/social media accounts. The demarcation between native data and external data strongly relies on the difference between data produced by the machine (online dashboard) versus the data documented in a dashboard. Native data is constantly attracted and updated. External data is providing data more in the sense of summarizing data not produced online. In cases of doubt we considered the existence of a refresh button as demand or split between natively digital or external produced. A number of criteria indicate whether a dashboard needs to be considered static or interactive: the ability to select data sets, visualizations, and layouts; the ability to search; the ability to create or edit content; and the ability to send and receive messages. Indicators of static dashboards were basically the absence of indicators of interactivity. In order to determine the staticness or interactiveness of a dashboard, all 180 images in the dataset were rated by three participants, on a discrete scale from 1 to 5. On this scale, 1 refers to most static, 2 to mostly static, 3 to equally static/interactive, 4 to mostly interactive, 5 to most interactive. For each individual image, the average of the three ratings and the total absolute difference between these ratings was calculated. If the total difference was >7, ratings were reevaluated with the group. After this, no difference was >7. After the rating, the average of the ratings of the respective 30 images as well as the standard deviation of these ratings was calculated for each year respectively. Dashboards were in this category also divided based on a binary categorisation. This division is pretty straightforward: either the dashboards contain icons or they do not contain any icons at all. In this sense, dashboards were considered to contain icons when they featured illustrative symbols that appeared like icons, such as arrows. This was the only definition that could be taken into account as further categorization was too complex and could not be extracted from the images. The definition of skeuomorphism used here is based on three premises: (1) if it refers to an old device or tool but the reused characteristics no longer have a function it is skeuomorphism, (2) if it refers to an old device or tool but the reused characteristics have a function it is not skeuomorphism, plus (3) if it is an icon we don't consider it a skeuomorphism since icons have and/or support a function. As was mentioned earlier, there were two approaches for visualise our findings: on the one hand, we created grid-layouts according to each category, on the other hand, an online version was developed to allow a more interactive experience of the dashboard of dashboards. One of the most compelling aspects of visual data analysis is in the ways it augments the natural abilities humans have to seek and find patterns in what they see. The easiest way for patterns to emerge is by using a grid-layout, which also offers an overview of the total dataset. The grid layout consists of a set of regular, two-dimensional grid units. As we are interested in changes over time, we chose one dimension to be annual; the second dimension represents the images' relevance in Google Image Search. For each category the same grid was used as a basis, however, differing colours and icons were assigned according to each characteristic. For the online version of the dashboard of dashboards, we created a website. When the page is visited, you are presented with an assemblage of sorts of the acquired dataset. Using the buttons it is possible to filter the images, showing the dashboards that fit into the combination of the selected categories. The website was developed in HTML5 with CSS3, keeping the code easily readable by humans and the website interpretable for a multitude of computers and devices. The filtering functionality is supported by a jQuery script, to simplify the HTML scripting. Furthermore, this allows for the website to be easily updated and to be extended in the future, as only limited knowledge of coding is necessary. 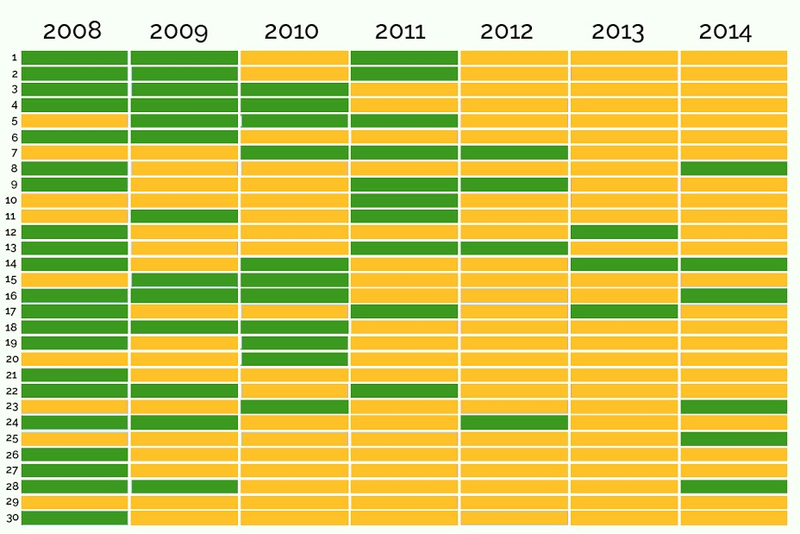 Starting of in 2008 we can see a clear business oriented range of dashboards overall. This was a range that remained present throughout the years. In 2008 uses include: monitoring revenue streams, ticketing systems, IT security systems and customer analysis. In 2008, all dashboards found were digital, but contained many skeuomorphism that connote with earlier times. These include features represented by elements as speedometers, levers and thermometers that are very much connected to mechanical objects. Colors are plentiful and include both primaries and more subdued tints; the overall color schemes are often unbalanced. Interactivity is limited to customizing layout and/or data set selection and whereas some dashboards clearly show their sources (database-like), others hide them. Data is mostly visualized via graphs and charts, showing periodic data, not real-time data. Also, there are little or no controls that allow for direct interference in processes. Lastly, there exists a very low degree of customizability in the dashboards displayed. In 2010 however, there is a shift visible regarding personalisation and customisation; a number of dashboards offer the ability to personalise it by dragging and dropping items. In general, therefore, it could be concluded that dashboards are becoming adjustable. In 2011 dashboards as extracted from Google images have become much more dedicated to the digital realm; the Skeuomorphic elements have diminished (levers, speedometer and such), conflictingly though it is the only year where an actual image of a car dashboard appears (albeit a digital rendering). It seems that dashboards are much more defined towards analytical dashboards, therewith focussed on the measuring of user behavior such as user interest, click rates, bounce rates etc. Personal dashboards manifest themselves from 2011; not in the sense of personal data but personalised dashboards, as witnessed by the appearance of the possibility to login. With regard to the design, colors are much brighter than in earlier years and a lot of graphs are presented. Regarding the distinction of business and personal dashboards, there are still a lot of business dashboards in excel and Google analytics in 2011. New is that there were several dashboards that interacted with social media to track posts from several different social media platforms. Other dashboards were not actually dashboards that function as such but advertisements for dashboards for managing business but especially for managing personal life. 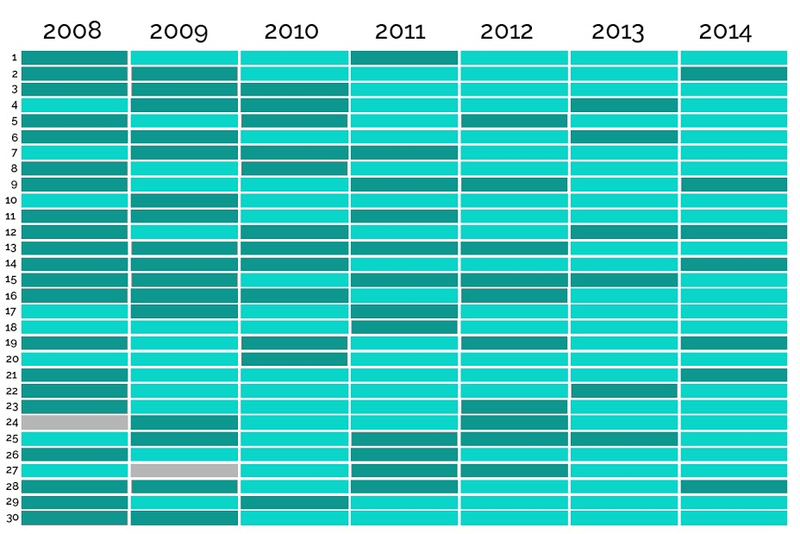 Overall from 2013 on, dashboards found have become more minimal, cleaner and numbers are larger. The first limitation in our research was that we could not found any images on Google Images before April 2008 in Google images, so our query in 2008 commits the results before April. When we used the images scraper to extract the images, the thumbnails were too small for analysis, this is due to Googles change in policy regarding image extraction from the overview page. We had to extract the images manually. We could only analyse the images platonically as we do not know the deeper working of a dashboard (but this strikes an interesting notion of control as well). Furthermore, the images that we retrieved from particular years do not necessarily mean that the image was created in that year, but merely uploaded at this time. We could also see this in repetition of results over the years. For instance a dashboard from 2011 is found in the results from 2014. This makes us question how Google forms the results, but this indicates we are dealing with reuploaded and reused images. A final limitation is that the categories we created are never all encompassing, some images fit in both or neither of categories we made. We mainly found dashboards used for organizational purposes throughout the whole research period. These were either used for sales analysis, customer relationship management or monitoring financial figures. However, there were also a variety of website monitoring dashboards and it was not clear whether these were used by organizations or by individuals. We came to the conclusion that such specific dashboards should not be included in the further analysis of respective category. There is an overall trend towards a more personal use of dashboards. 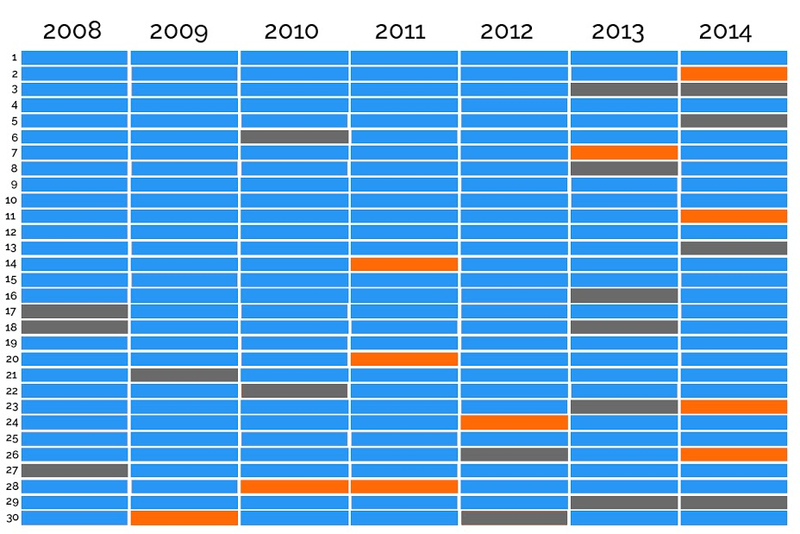 While in 2008 there were no dashboards for personal use, in 2014 we found four of them. Still, organizational dashboards remain to be the dominant depiction of dashboards in Google image search throughout the years. Personal dashboards served as a sort of start page with several elements such as weather and social media interaction, as a sort of personal portal to the Internet. Overall, throughout the dataset there is a shift visible from dashboards that use external data that was not produced online towards dashboards that are based on data with an online source, natively online data. There is a decreasing number of dashboards featuring external data whilst there is an increase visible in those featuring native online data throughout the years that were being taken into consideration in the analysis. In general, there are a few shifts that could be identified out of these results: from documenting to monitoring, from archived data to actionable data (as fundament for concrete future steps), from savers of knowledge to producers of knowledge. 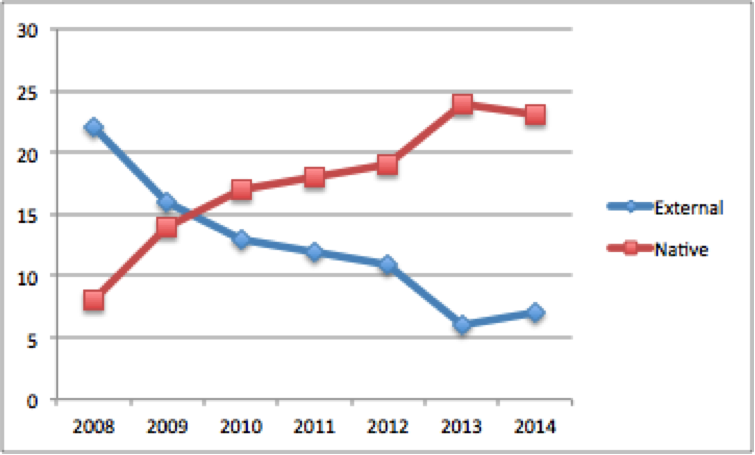 Between 2008 and 2014 there was a clear increase (1.1 point on a 5-point scale) toward interactivity. 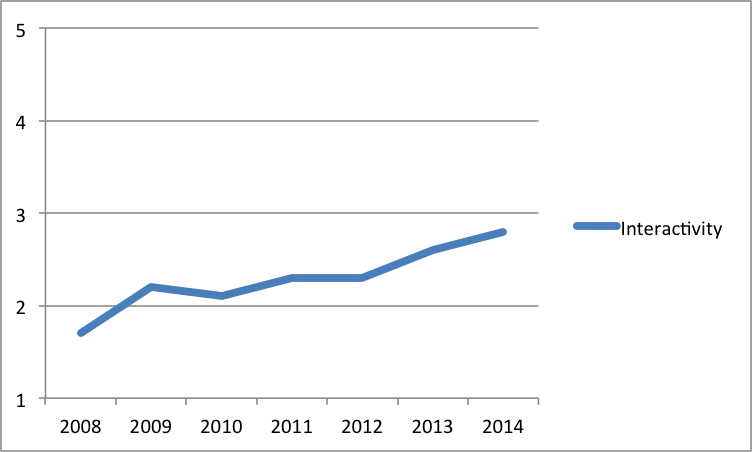 The biggest jump is from 1.7 in 2008 to 2.2 in 2009; incidentally, both years ratings also have the smallest standard deviation. While rating the images, we observed that new types of dashboards have been introduced. Dashboards for online content management proliferated around 2010 and were all very interactive. On the other hand, a steadily increasing number of relatively simple and static dashboards for personal projects kept the interactivity rating from raising even higher. All years feature substantial use of icons. there are no big changes in the quantity of icons over most years, except for 2008 that featured about half the amount of use of icons compared to the other years. 43% of the dashboards in 2008 feature the use of icons. 67% up to 87% of dashboards between 2009-2014 feature the use of icons. 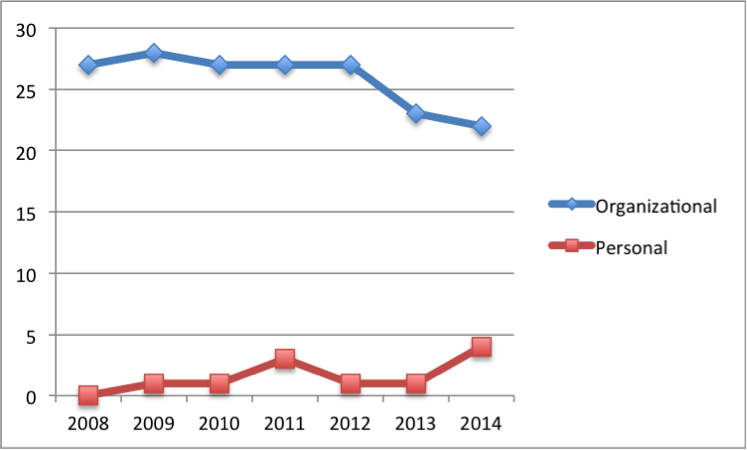 The analysis provided no clues for an increase or decrease in icon use over time. Differences mostly occurred in relation to design trends as icons become more visually abstract, decreasingly reflecting the real world. An interesting notion is the rise of social icons as well as the appearance of the mechanical cog wheel to indicate settings. Overall, skeuomorphism is limited mostly to old dashboard meters. We can see these kind of meters getting more abstract over the years and less dashboards use meters as a metaphor. From a control standpoint: skeuomorphism are used to give a sense of comfort and familiarity through design which could be seen as a form of control for the user. It can also have direct effect on the usability of the dashboard. The more familiar the dashboard design, the easier it is to understand and the more 'control' the user feels. Interestingly the skeuomorphisms are used less over the years, which could indicate that this idea of familiarity has changed (people have been getting used to digital formats). First of all we should address that a lot of decisions we made during the process were based on practical considerations. For instance, we chose five categories because it was an easy number to divide between groups. We chose 30 pictures because we had to do it manually and more would be too much work in the set timeframe. The categorization we made relating to the categories are also not objective, and thus we suggest that more research needs to be done in this categorization process, both on a qualitative and quantitative basis. The results show that there is a decrease in skeuomorphism and external data, and an increase in personalized dashboards, the use of iconography and interactivity. Out of this, we can conclude that the representation of dashboards through the medium of Google Image search, changes over time towards a more personalized, interactive dashboards. Although controversial, this could be linked to the increase in data gathering practices and the introduction of (personalized) tools over the researched years. The images retrieved from Google Images show that dashboards still mediate between the data and user, although we can speculate who is the user: either an organization, government or person. To describe the way we experienced the representation of dashboards, we want to propose to use the cog wheel as a visual metaphor that reminds us of the mechanical age. 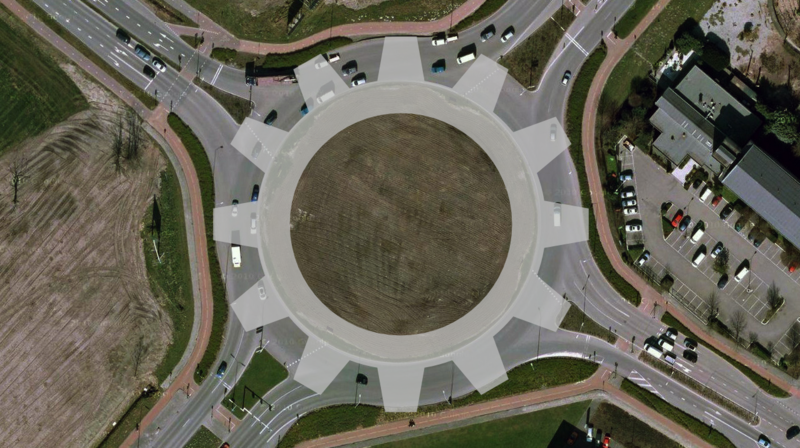 The cog wheel offers more control to users by customizing and adjusting the dashboard according to their own wishes. However, users do not have real control because there is only a predefined route to follow. Deleuze uses the highway system as metaphor for this situation: drivers think they are able to choose their own route, but are limited to the highway routes that are already determined for them. This metaphor could be adjusted to dashboards as well: we can conclude that users are getting more control in the sense of adjusting settings and customizing layouts, but these possibilities are already pre-defined. Agre, Philip E. Surveillance and Capture: Two Models of Privacy. The Information Society 1994: 101127. Bartlett, Jamie and Nathaniel Tkacz. Keeping an Eye on the Dashboard. Demos Quarterly (2014). Cheney-Lippold, John. "A New Algorithmic Identity Soft Biopolitics and the Modulation of Control." Theory, Culture & Society 28.6 (2011): 164-181. Dodge, Martin, and Rob Kitchin. "The Automatic Management of Drivers and Driving Spaces." Geoforum 38.2 (2007): 264-275. Few, Stephen. Dashboard Confusion Revisited. Visual Business Intelligence Newsletter (March 2007). Manovich, Lev. Cultural Analytics: Visualizing Cultural Patterns in the Era of More Media. Domus (Spring 2009). Rogers, Richard. Digital Methods. MIT Press, 2013. Tkacz, Nathaniel and Gross, Ana. "Dashboard Interfaces." Interface Critique. 2014. Retrieved 16 January 2015.
n. a. "Four to Five Years Visual Analysis." 2010 Horizon Report. 2010. Retrieved 16 January 2015.